I gave this to my sister and her husband for their anniversary. They were delighted to receive their favorites. Can't find a better varieity of hot sauces. Jan 4, 2012 | By D.D. 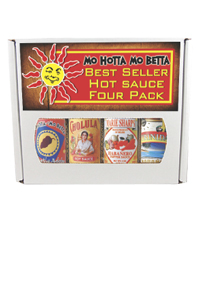 I bought this as a gift for my dad who is a fan of the hottest of hot sauces. He said these aren't the absolute hottest, but he went on and on about how awesome the flavors are of these sauces. Excellent for anyone who likes hot sauce.